Retrained Combat Casting for Selective Channeling at 6th level. Sandara’s calling came one night when a fleet of fishermen, which included her father, was lost in a powerful storm. 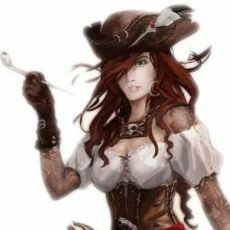 Sandara prayed to Besmara the Pirate Queen, the goddess of piracy, strife, and sea monsters, and when her father returned the following day, weatherbeaten and half-drowned but still alive, Sandara knew the goddess had answered her prayers. Soon after, Sandara began devoting her time to the worship of Besmara, eventually setting up a small chapel on the Hell Harbor docks dedicated to her. Just 3 weeks ago, Sandara’s beloved father died, and she took to the sea, determined to live her life to the hilt, not rot away in some forgotten port. She only made it as far as Port Peril, however, before she fell afoul of Captain Harrigan’s press gang and ended up aboard the Wormwood. 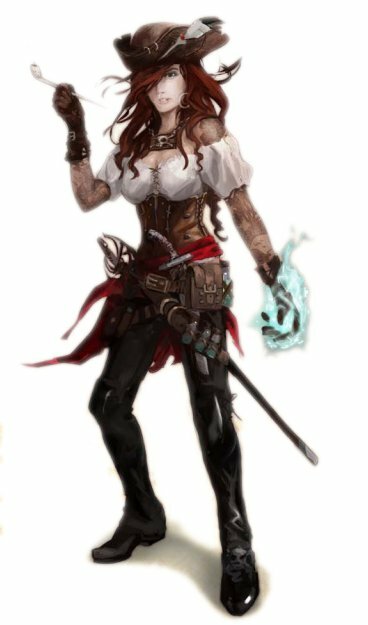 She befriended the PCs, who came to her rescue when grindylows stole aboard the Man’s Promise during a storm and took her to Bonewrack Isle. After a successful mutiny against Mr. Plugg, she now serves as a voluntary member of the crew. Sandara has taken to her new surroundings like a fish returned to the sea from which it was born. She still bears the raw scars of grief from burying her father, but knew enough to mask that grief on a vessel such as the Wormwood. Sandara plans to make the most of her present situation, intending to spread the word of her goddess while expanding her horizons at the same time. She considers all of the PCs friends, and is attracted to Chopper. She doesn’t quite get along with the Rahadoumi Leila al-Zahra, but tries to keep the peace for the crew’s sake. During Combat If she is expecting combat, Sandara casts instant armor, which increases her AC to 17. Sandara takes every fight seriously, and once she gets started, she finishes things. She targets her opponent with doom and summons a small elemental or 1d3 dire rats to fight by her side. Morale Sandara is almost foolishly stubborn, a quality that might very well get her killed someday. She won’t surrender and doesn’t back down from a fight unless totally overwhelmed.